Breaking waves over the open ocean are recognized as the main mechanism generating sea salt particles in the atmosphere. 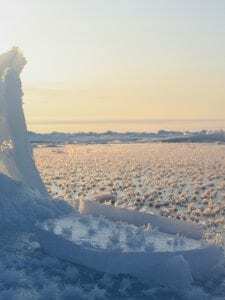 Yet, observations of sea salt particles over polar regions display characteristics that are inconsistent with this source from the open ocean. 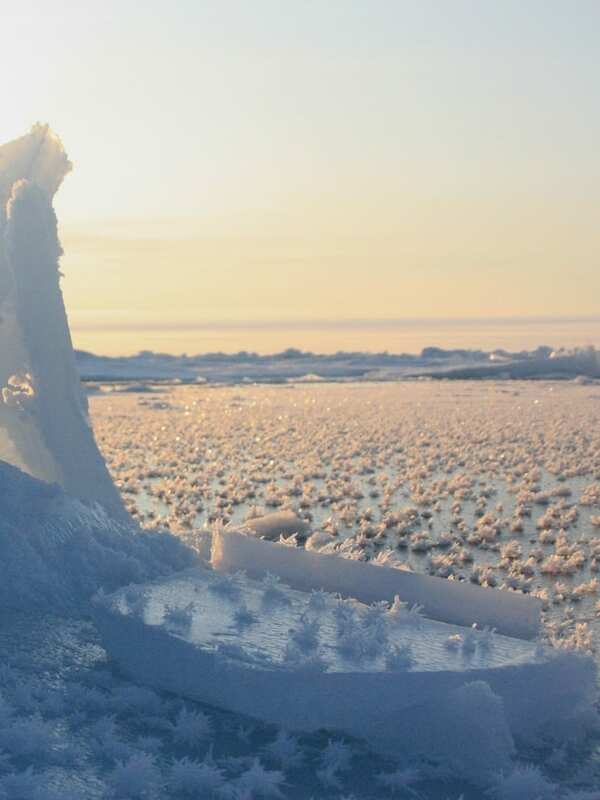 In this project we examine two other potential sources of sea salt particles over sea ice surfaces: wind lifting of saline snow particles (blowing snow) or frost flower crystals. Huang & Jaeglé (2018). Wintertime enhancements of sea salt aerosol in polar regions consistent with a sea ice source from blowing snow. Atmospheric Chemistry and Physics. Link. We implement a blowing snow and frost flower parameterizations in the GEOS-Chem chemical transport model, which we validate against multi-year in situ observations of sea salt aerosol at coastal sites in the Arctic and Antarctic. We find that the simulation with blowing snow emissions of sea salt aerosol is able to reproduce the wintertime observed levels of sea salt aerosol as well as their large day-to-day variability. The frost flower simulation cannot fully explain the seasonal cycle and daily variability of the observations. Overall, this comparison suggests that blowing snow is likely to be the dominant source of sea salt aerosol during winter, with frost flower playing a much smaller role. Huang, Jaeglé & Shah (2018). 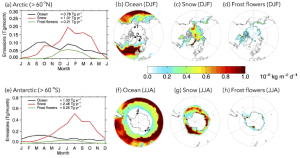 Using CALIOP to constrain blowing snow emissions of sea salt aerosols over Arctic and Antarctic sea ice. Atmospheric Chemistry and Physics. Link. 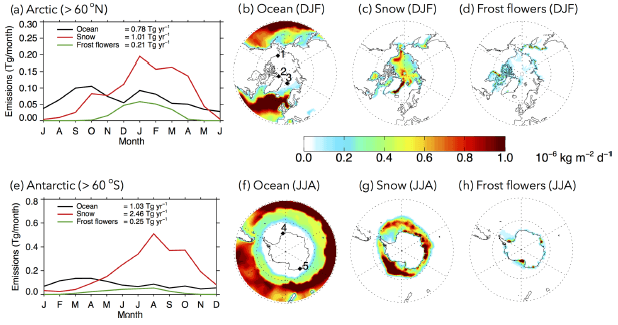 In this study, we use 2007–2009 aerosol extinction coefficients from the CALIOP lidar onboard the CALIPSO satellite and the GEOS-Chem global chemical transport model to constrain sources of sea salt aerosol over Arctic and Antarctic sea ice. 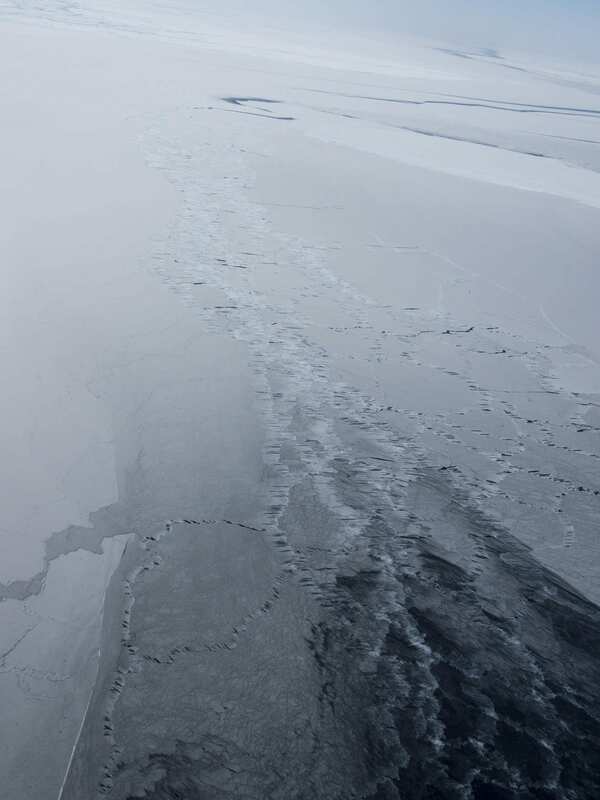 We find that a standard GEOS-Chem simulation without sea ice sources of sea salt aerosol underestimates CALIOP extinctions by 50-70% over Arctic and Antarctic sea ice. We find that the addition of blowing snow emissions of sea salt aerosol is necessary for the GEOS-Chem model to reproduce the CALIOP aerosol extinctions over sea ice regions during cold months. Using the CALIOP aerosol extinction coefficients, we derived monthly-varying surface snow salinities, which further improves the performance of the blowing snow GEOS-Chem simulation.